Parents hope the artificial field at 851 W. Waveland Ave. will mean fewer mud stains and more playtime. Pictured: Ald. Tom Tunney (44th). LAKEVIEW — Ald. 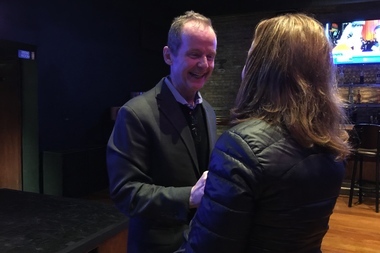 Tom Tunney sailed to an easy victory in the 44th Ward Tuesday night. With 95 percent of precincts reporting, Tunney had 67 percent of the vote, according to the Chicago Board of Elections. Mark Thomas got 23.5 percent of the vote and Scott Davis 9.4 percent. "I think people feel that Lakeview is moving in the right direction and is a successful community," Tunney told DNAinfo Chicago late Tuesday. "I feel that there's a level of trust with my stewardship of the ward and there are high expectations." During his acceptance speech around 9 p.m. Tuesday, Tunney said he would continue to focus on bettering Lakeview schools, lowering crime and growing the business districts. Ald. 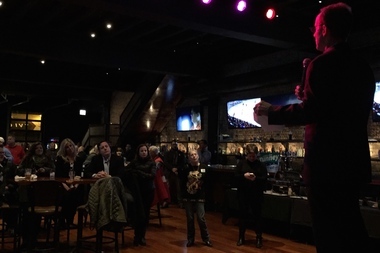 Tom Tunney and his supporters celebrated his unofficial victory in the 44th Ward at John Barleycorn on Feb. 24, 2015. "People are saying there's just too much corporate business on Southport — there's Gap and there's J. Crew and Anthropologie," he said. "We talk about neighborhood vitality and the vibrant business district. Wouldn't every neighborhood in the city of Chicago envy what's happening on Southport or Broadway or Belmont? Let's celebrate our success." For the first time since he was elected in 2003, Tunney faced opposition in Tuesday's race. 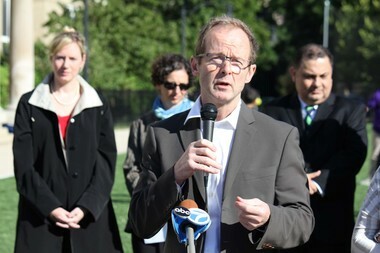 Thomas and Davis both criticized Tunney for his handling of the Wrigley Field renovation project and crime rates in the 44th Ward. Although neither challenger was able to gain traction in the 44th Ward, Thomas said the election results showed "one in three people in this ward are very upset." "I heard from hundreds of people today personally thanking me for running, so there's a very strong, angry streak here in Lakeview," said Thomas, who added that he will run for alderman again in four years. Thomas, longtime entrepreneur and owner of The Alley and other Belmont Avenue shops, said he ran a better, more personalized campaign than Tunney. "I don't think it's good for the ward or the businesses that he won," Thomas said after conceding the race. "I knew going into this I was one-in-four to win, but I wasn't going to let him run unopposed." 44th Ward Ald. Tom Tunney is illuminated by pink lights on the John Barleycorn stage during his acceptance speech following a victory during Chicago elections Feb. 24, 2015. Davis was not immediately available for comment. Check out our full 2015 Aldermanic Election guide for more info on the candidates in this and other ward races.